Today we are having Sunday Brunch at a moovelous place in Smithtown, NY called "Maureen's Kitchen". Everything there is themed with cow spots! 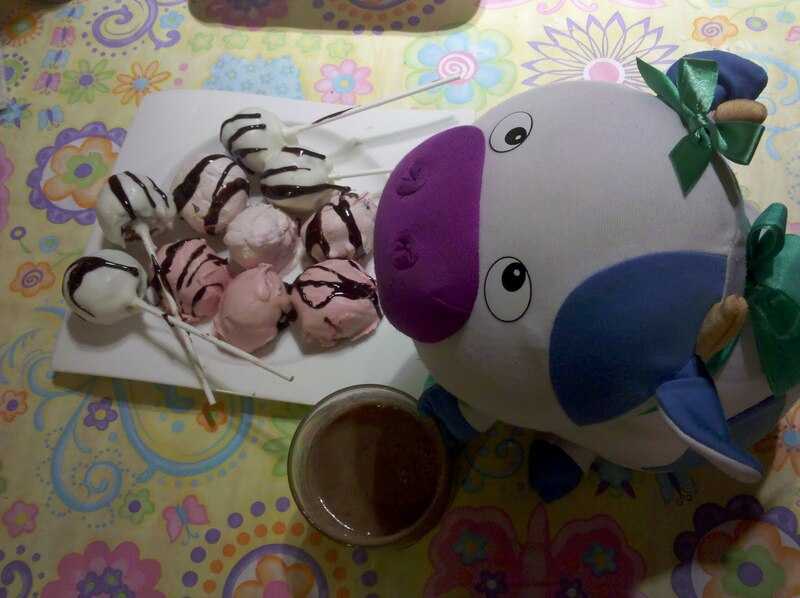 It is really a moorific place and I feel at home there. I try to wear my cowgirl dress so I have black spots when I go there. I ordered a fruit plate and chocolate chip pancakes ... with a cup of cowfee, of course! 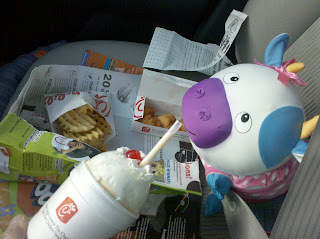 When I travel to the South, my favorite snackage is Chick-fil-A. First they serve chicken and not cows. Secondly, they have the best shakes in the world. They are WAY too big for me drink the whole thing but if my Keeper holds the up for me, I can sip and sip away. Of course, the fries are the bomb -- how can you not fall in love with a crisp waffle fry with every bite? My only cowplaint is that they won't use me in their ads. I think it is time for a feminine bovine to be in their cowmericials ... plus I think their mascot is super handsome, and doesn't every bovine deserve a hot bull?! MOOORAY!!! Today there was a Moolette sighting in Melville, NY at the best kiddie park around Adventureland. I won't lie -- I loooooove to have dates there. 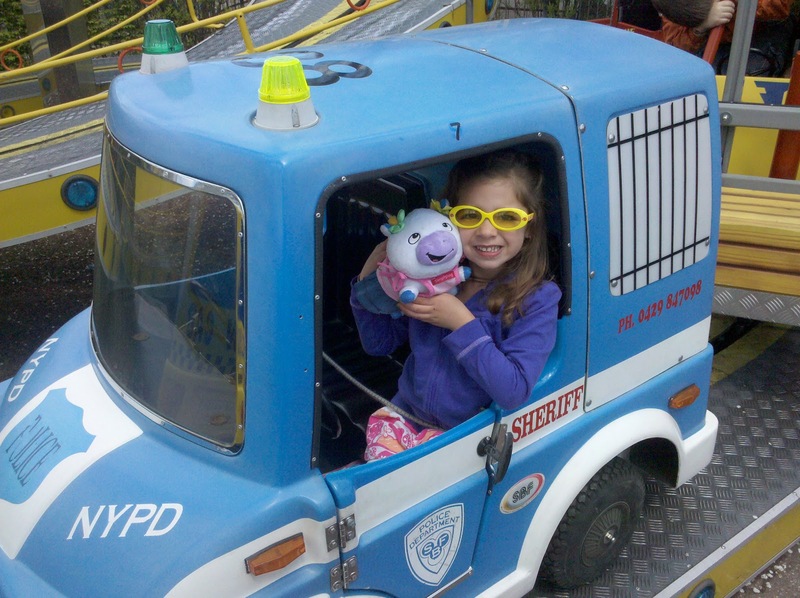 Today we met a nice little girl who took her mini moo on the car ride. Her moolette had a moorific dress on. Hello Beauty Girls!!! Holy Spots! I made cake pops and cake balls for Mother's Day. They take much longer to make than a traditional cowcake but I had five orders to fulfill for the holiday. I finished my deliveries by 3pm but then I had to make treatola for my family dinner and my date with my Mooma. I made chocolate fudge cakes with pink and white chocolate dip. I wont lie - they are scrumdelish! Mail Call! Today I got a ton of boxes in the snail mail. They were too heavy for me to carry to my cowdominum but luckily Handsome Harry was home to help me. 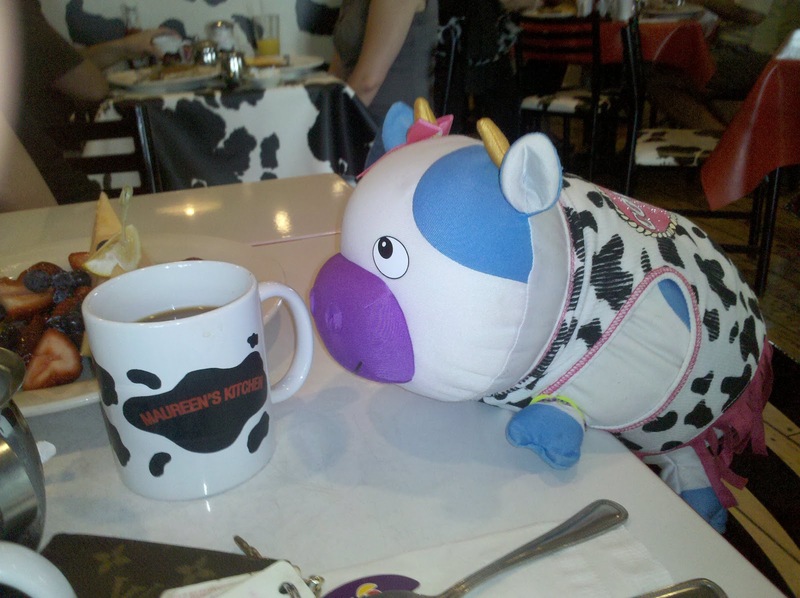 I have been getting a lot of special requests for my My Cow Moo merchandise which makes me overjoyed. 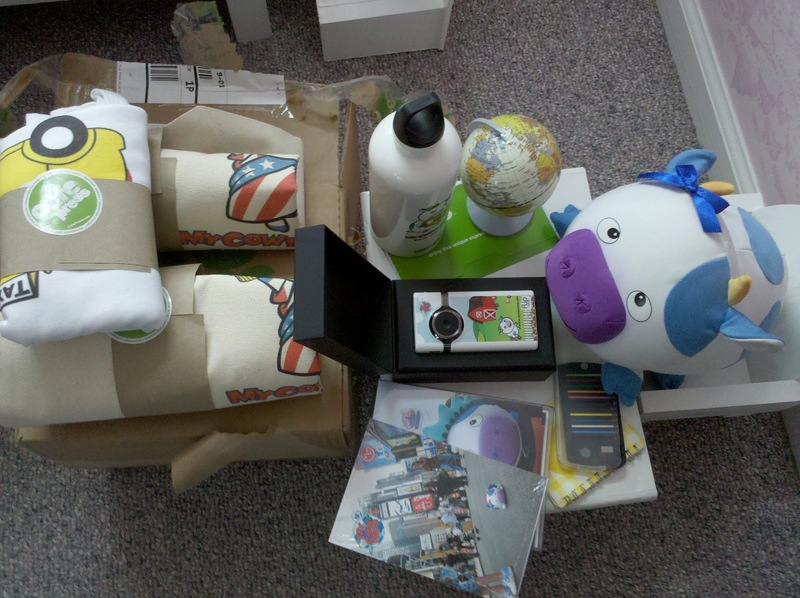 This week alone we had two orders for my cowstumized Flip video camera. My SIGG water bottles have been hot. I love to know that people are recycling! Today I had a date for snackage at PF Changs. 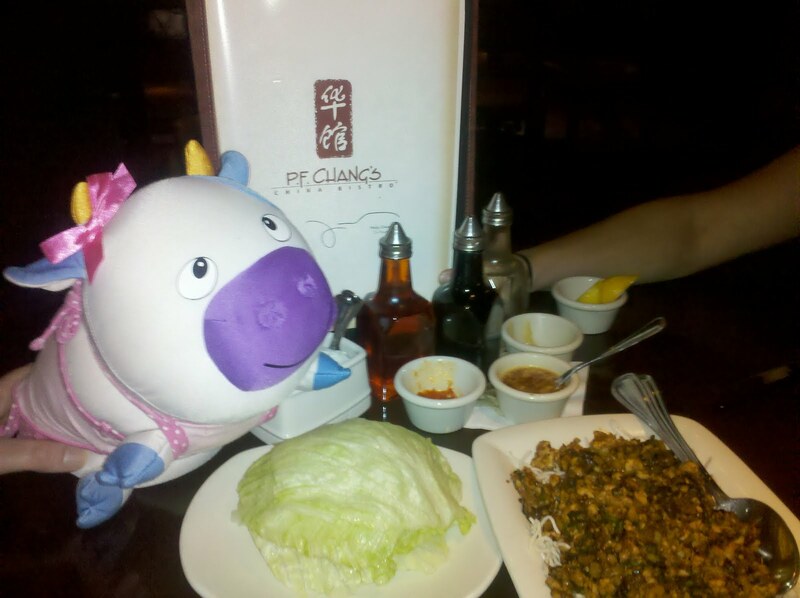 I just love to have chinese food and PF Changs makes the best lettuce wraps! There is nothing prettier than a cup of food surround my cool iceberg. We had lots of other little snacks too but this was my favorite. The only thing better was the cowpany!!! 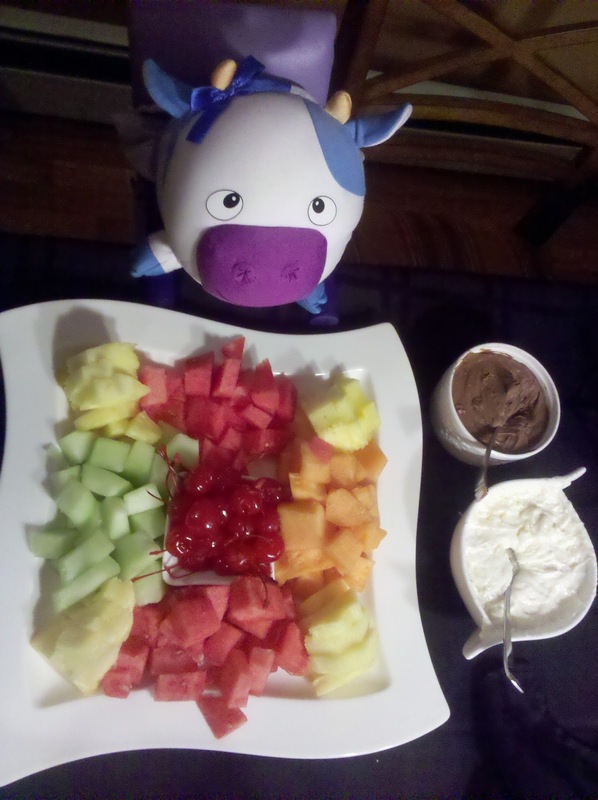 Moooray -- what more could a bovine ask for? Meet the newest addition to my Garden for 2011 -- Baba the Fig Tree! I looove figs and have been lucky enough to sample from my neighbor's tree but I enjoy so many different types of Figgy snackage that I thought having my own tree would be better and more reliable. We bought Brown Turkish figs because they are supposed to the sweetest. So far there are four figgies growing but I hope if I talk to Baba everyday, she will grow to be big and strong. The white stuff around Baba's base is Lime. The man at the Nursery said that the plants looooove Lime. I was excited -- who doesn't like citrus? And maybe Baba and I could have moogaritas ... but the man laughed when I said that. I don't know why it was funny but my spots started to blush. 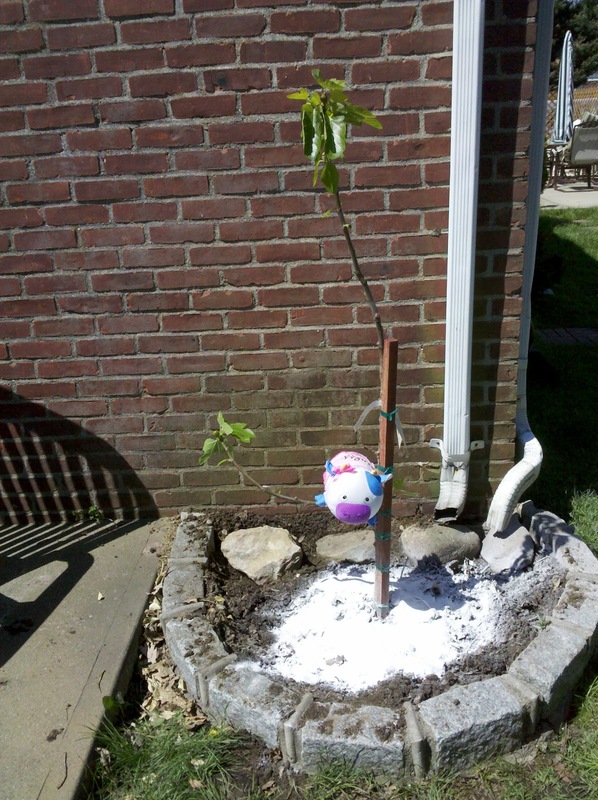 It turns out he meant lime powder for gardens. Who knew?! As many of my cowpals know, I believe that Food is love. When you cook for someone, you are sharing of yourself in the most loving way possible. I try to cook for my family and cowpals as often as I can because there is nothing better than feeding the soul with love. Today Chef Anthony at the Brooklyn warmed my soul with lovin -- he made me a heart shaped pizza! I was blushing when I saw it; and I won't lie -- It made me feel VERY special. I gave him a smooch... it was the least I could do. When I got home, we reheated the snackage and I shared it with my keepers because "sharing is CARING and caring is FUN!!!" Today is a special day -- my Keeper is letting me have breakfast in bed. I won't lie -- my bed is my favorite place to be. Not just because the headboard is shaped like my face, but because it is so warm and cozy. Plus, I have a remoote control TV now that I am a big girl cow. 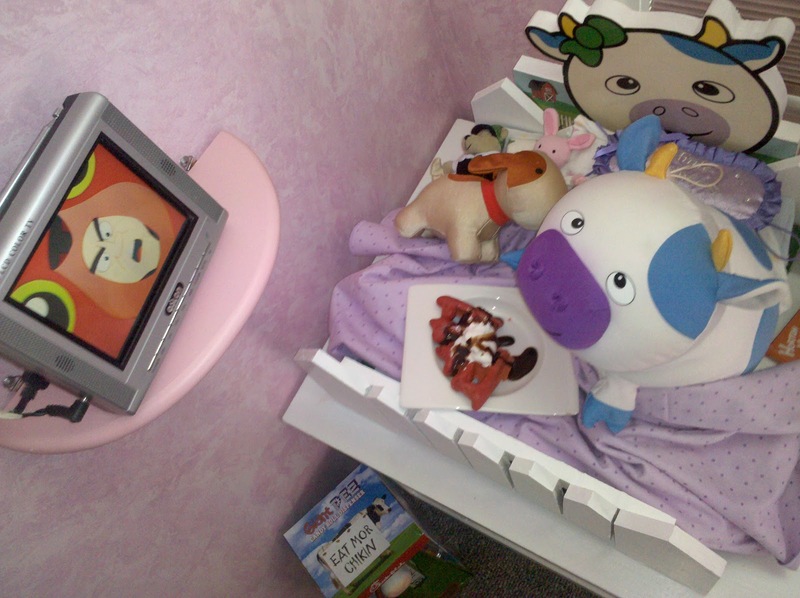 I looove to watch cowtoons. We made waffles today and that is a BIG treat. Even better -- we made Red Velvet waffles. Talk about treatola. Cowpletely Delish!!! For the love of Moo!!! My package was moooovelous. It was filled with a Box o' Lovin from my favorite little Brownies. Inside was a moosical box that had a moovelous photo mooment of the troops in Group 2552 and noteage from each of the Brownies I met in March AND a note from each new cowpal. It is going to take me hours to read them all ... and even longer to write back but I am so excited that my spots are glowing!!! HOLY SPOTS!!! Today I got snail mail!!! Usually when we get mail it is a pile of bills, but today there was a package for me! MOOORAY! I just got a package, I just got a package. I just got a package -- I wonder what's inside!!! Rainbow Ice is Oh, So Nice! I had a craving for an Italian Ice today. There is only one place I could think of to solve my craving -- The Brooklyn Square in Seaford, NY. They serve Uncle Louie Gee's ices. They have so many flavors to choose from but Rainbow is my standby flavor. I got a kiddie cup but it was sooo huge that I could only eat half. I took a menu home with me so my keepers could order that yummy square slice for me! MOOORAY!!! 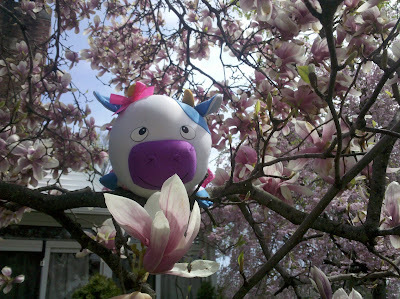 It was a beautiful day today -- the sun was shining, the air was warm and my Magnolia tree was in full bloom. I love to spend time hanging around in the tree; there are only a few days before the petals fly away and it turns green and leafy. The magnolia leaves are not only pretty but extremely delicious!!! I spent as many hours as I could outside today because the weatherman says it will rain all week. I hope all of these April Showers bring beautiful May flowers! The best part of any holiday is dessert time. 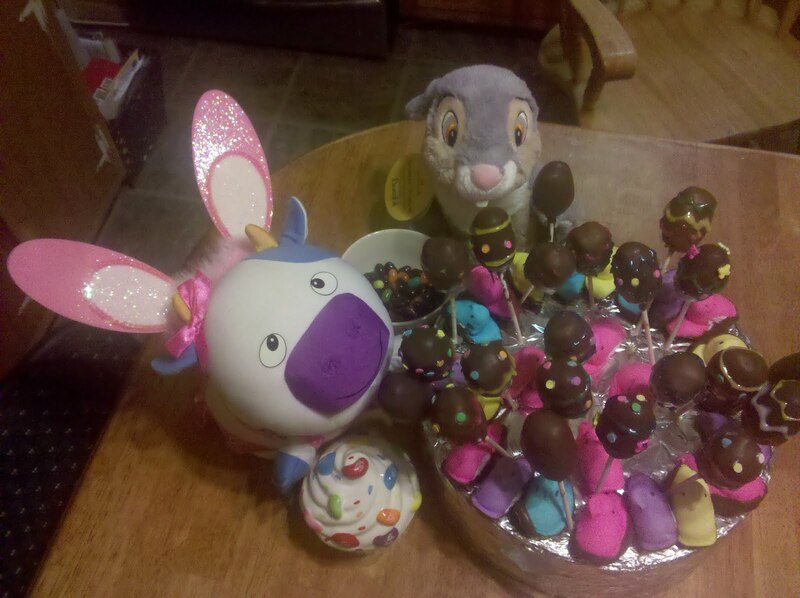 I couldn't wait to show off my Cake Pop Display; I knew my Auntie Janine would be in heaven with her chocolate cowvered Peeps ESPECIALLY because I left them unwrapped for two days. She likes them a little stale. While my presentation was moovelous, I could tell that someone had hit the cake pops before dessert -- we were missing quite a few; always a good sign!!! My Aunt Janine made me a special cake that looked like a Sandwich. It was so big that I could have slept on it but when I took the first bite, I squealed with joy -- it was stuffed with Nutella!!! Scrumdelish!!! 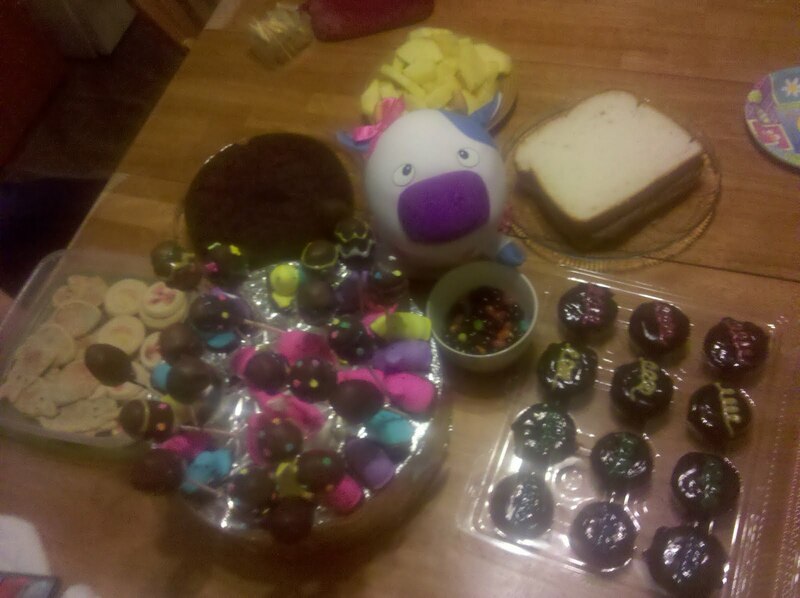 We were only 10 people but we had an embarrassment of desserts -- cookies, cowcakes, pineapple, peeps ... oh my! I started Easter Sunday by watching Easter Parade, as every young girl should. It is one of my favorite moovies. I love to play dress up and on Easter Sunday I get to wear a Bonnet AND a pretty dress. Hello? HI! What more could a bovine ask for? I brought appetizers to our family gathering -- I made something new that I hoped my Nannie would love: Dried Apricots with Blue Cheese, Candied Walnuts and Rosemary. I won't lie -- they were a huge hit. I have never had a dried apricot before but my flavors definitely worked well together. My Uncy Rob at six of them so I know that they were scrumdelish!!! Snackage by Moo: Cake Pops! As delicious as my cowcakes are, everyone expects me to make them for holiday meals. 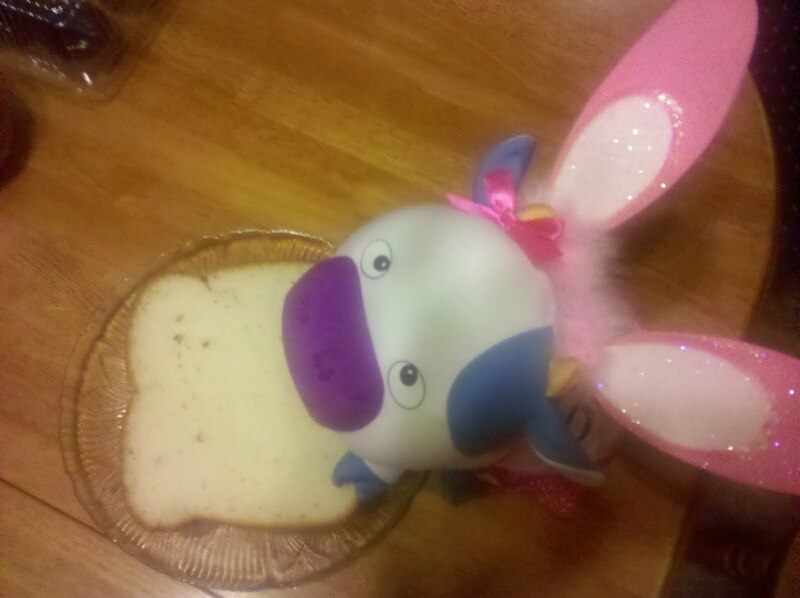 I knew that I had to pull out all of the stops to impress my Uncy Rob for Easter. And I knew that only one thing could do that -- Cake Pops!!! I have becowme cowpletely obsessed with the thought of a bite-size piece of cake on a lollipop stick. But outside of Starbucks, I have never seen them. I knew if I busted my hooves, I could whip up something scrumdelish. I made pistachio and red velvet cakes and made little cake balls shaped like eggs. 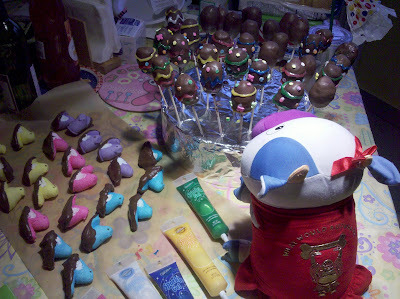 Once they were set in the fridge, I melted chocolate and dipped each cake so it would look like an Easter Egg. Then I spent hours decowrating them. I won't lie -- I'm going to sleep like a little sheep tonight. I wanted to make sure that my presentation was moorific so I dipped Peeps in chocolate to put around the base of my display. I know everyone is going to be super impressed tomorrow! MOORAY!!! Tomorrow is Easter Sunday. We are going to my Uncle Rob's house. 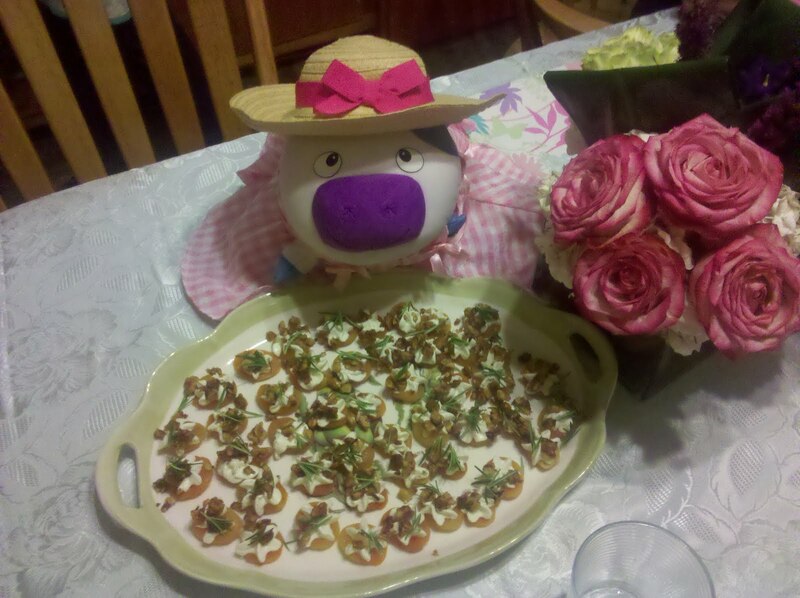 I'm super excited -- I get to wear a pretty dress, an Easter bonnet AND eat yummy snackage. Uncy Rob is a five-star chef. My spots were glowing when he asked me to make snackage -- both appetizers and desserts. It has been two weeks since my cowsins tried my Dark Chocolate Stuffed Cowcakes and I knew that I had made quite a few improvements since their first tasting. In honor of Easter I used different colored swirls to make the tray look moolicious. Knock wood -- I think they will be a hit! One of my favorite holiday treats is MatzohBrie. 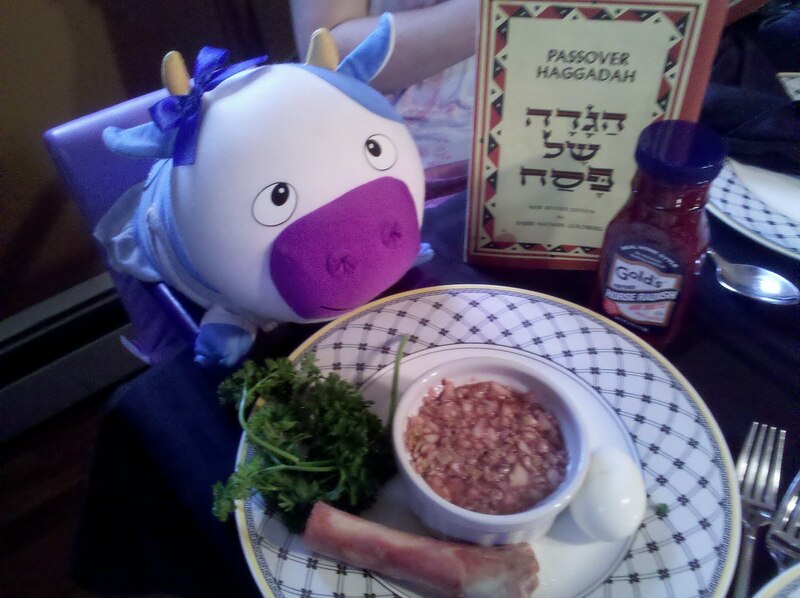 My Auntie Ellen always makes it for us during Passover; we usually have it for a Friday Brunch. It is similiar to French Toast but has Matzoh instead of bread. She adds syrup on top with a little sugar it makes my snout tingle with joy! There is nothing better than sampling all of the holiday snackage -- i think that is the best thing about holidays. I wonder what food there will be for Easter!!! For the second night of Passover, I was asked to bring snackage. 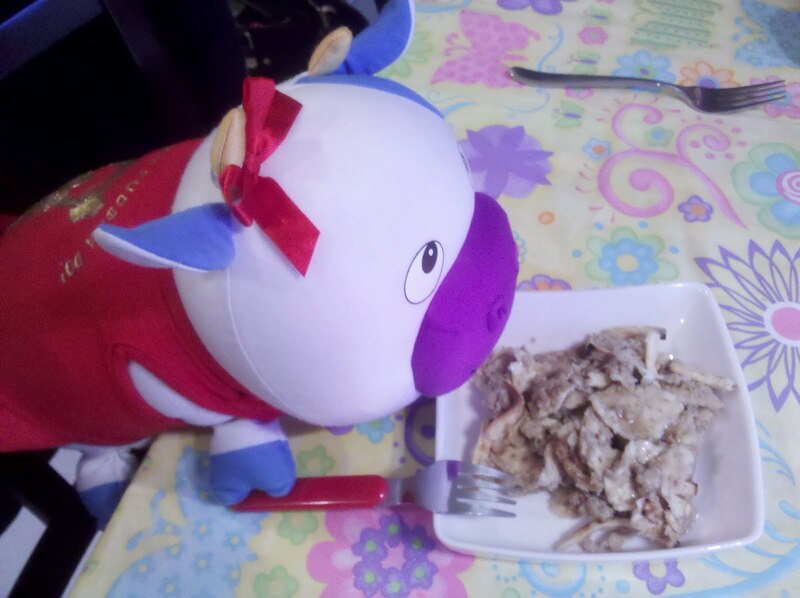 I love to make a cowtribution and there is nothing more loving than making food for your friends and family. Passover is about having sweet treats so I made a fruit platter for all of the skinny cows who are watching their figures that was accowpanied by a Marshmallow & Cream Cheese Dip and a Chocolate Cream Cheese Dip. 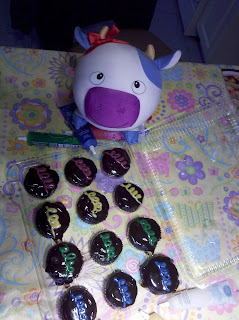 I thought it would be a nice change from cowcakes -- and you cant eat bread of Passover so it would have been a cowtastrophe to bring a tray of cowcakes! 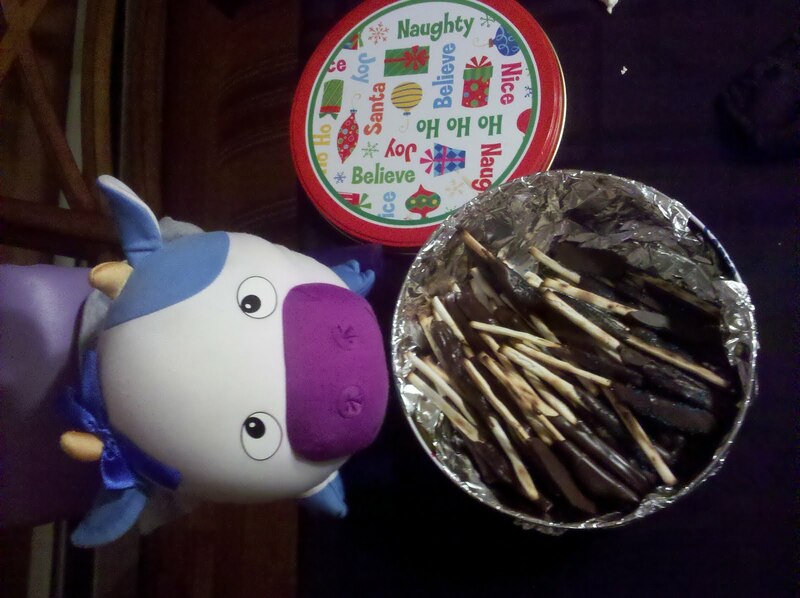 I also made Chocolate covered Matzoh because I thought my cowsins would really enjoy it! I was right -- they loved the Matzoh sticks. As a goof, I brought them in my Christmas tin. I thought it would make everyone laugh -- and it did!!! Tonight is the first night of Passover and I am spending it at my Cowsin Heather's house. She is the mooma for my cowsin Jack. Passover is a big family night. We eat a lot of bitter herbs and Matzoh instead of regular bread. 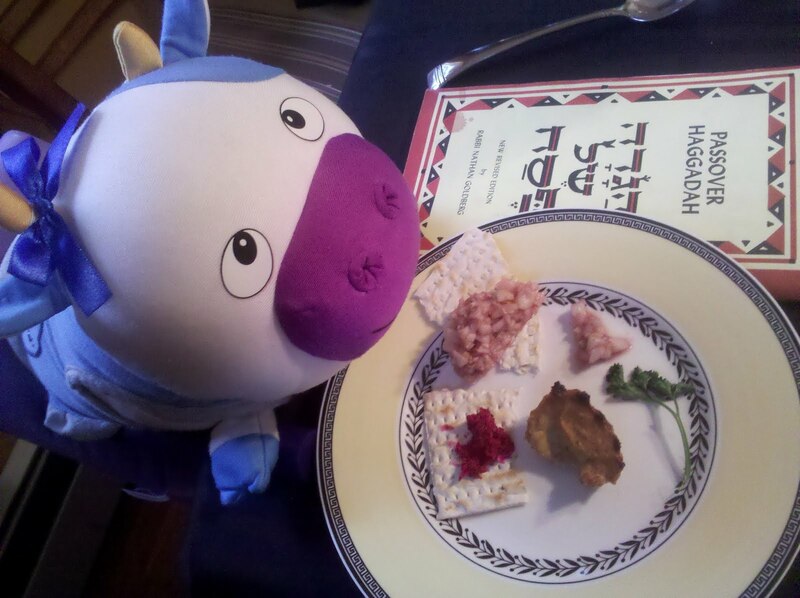 We also read from the Haggadah before dinner. 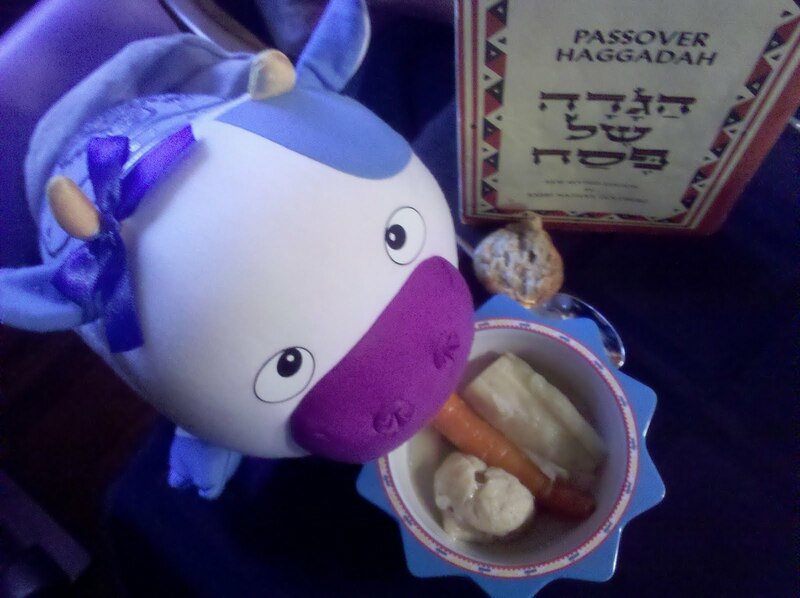 Once we read 20 pages, we get to have Matzoh Ball Soup and I am a happy little cow. I am the youngest child at the table so I get to read the questions about what makes tonight different than all of the other nights. It makes me a little nervous to read outloud but I took my time to make certain that I didn't skip any words.